Brevard, nestled in the Blue Ridge Mountains of North Carolina, offers visitors and residents many cultural and outdoor activities. The town provides a special quality of life. Brevard’s charming downtown has plenty to offer. Numerous small galleries, great restaurants and shopping make this downtown truly fun and unique. It’s one of America’s Coolest Small Towns. The town is home to numerous festivals and events. 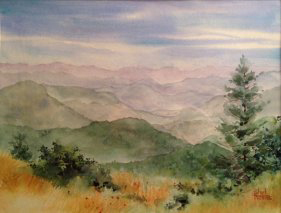 Check out the 4th Friday Gallery Walks when the town’s art galleries stay open late. Brevard is located in Transylvania County where more than half of the land is protected by State and National forests. These forests are special places that will capture the outdoor enthusiast in anyone. Hike along a winding river or get in an inner tube and float. Pack a picnic lunch and find your own special place. Watch the migration of birds or just be. You will find an abundance of fun things to do outdoors - play, learn or just relax. Our area is called the Cycling Capital of the South for good reason. 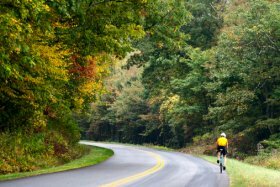 BIKE magazine chose Transylvania County as the backdrop for its annual gear testing calling Brevard “ground zero for some of the best riding in the nation”. Between Pisgah National Forest and Dupont State Forest, you will find more than 300 miles of single track waiting for you. For road bikers, there plenty of cycling opportunities too. Brevard is called the Land of Waterfalls for good reason. There are more than 250 waterfalls in Transylvania County. Some are just off the road and others are off the beaten path. Everyone of them is unique and beautiful. You will find Whitewater Falls, the highest falls east of the Rocky Mountains. Sliding Rock - a 60 foot natural rock slide - is a favorite place of the young and old alike on warm summer days. If it’s hiking you’re into, Gorges State Park, Dupont State Forest and Pisgah National Forest offer more than 1000 miles of trails. Climb a mountain or meander through a shaded forest. The hiking here is unsurpassed. Transylvania County has some of the best fly fishing anywhere. In fact, there are over 500 miles of trout streams within a one hour drive from Brevard. No wonder so many people fish here. 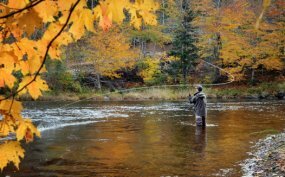 Be sure to check out Davidson River, the North and South Forks of the Mills River and Avery’s Creek. You’ll be hooked for sure! A narrow, winding road - 276 South - runs from Brevard to South Carolina. Along the way, look for artists’ studios and galleries. You will often find an open studio and some even offer classes. Check out the area for yourself. You're sure to find something fun to do.